By day, our team manned the booth and introduced visitors to the newest upgrades to Envirosight’s pipeline inspection solutions. In the evenings, our team met with customers and enjoyed The Big Easy’s fresh seafood and delectable beignets. 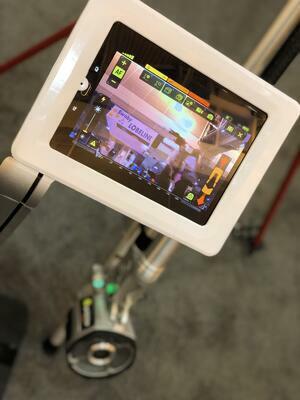 If you weren’t able to join us at the show, here are the highlights you missed from the Envirosight booth. The new Quickview brings all the powerful functionality of the original Quickview—with a few new features. This Quickview comes with dual-band Wi-Fi (2.4/5 Ghz) capabilities and provides full 1080p60 HD video for the highest detail. It also comes with easy video and image sharing thanks to the updated Quickview app. With an integration to the WinCan Web platform, sharing assessments is as simple as uploading to the cloud. The new Quickview app also supports approximate distance measurements for all models of Quickview camera. Or, for more precise measurements, the new Quickview may be purchased with a laser rangefinder accessory. Request a demo of the new Quickview airHD 2.0 and see firsthand how it can streamline your pipeline assessments. 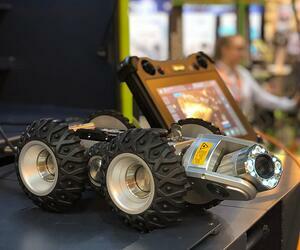 The new VC500 control pendant for the ROVVER X crawler system was also on display. This pendant replaces the old VC200 pendant and brings significantly more power and capability to the system. From the controller, operators can oversee all crawler functionality from movement and elevator height to laser measurement and auxiliary functions. In addition, operators can log observations and defects using their catalog of choice, build reports and upload them straight to the cloud for instant sharing. When you’re ready to discover the power of a single system, request a demo of the ROVVER X crawler platform. We also showed off the CleverScan. 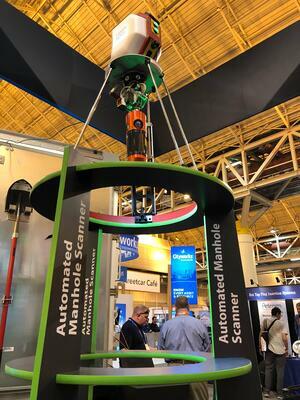 This highly-portable manhole scanner provides a full, HD scan of the manhole’s interior wall, a point cloud for CAD and other 3D applications, and a virtual environment for offline pan/tilt navigation. With just the press of a button, CleverScan performs a complete scan of manholes up to 33 feet deep in under two minutes. The battery lasts a full day, so a single operator can perform up to 50 inspections per day. At only 38 pounds, the CleverScan is the most portable system on the market, transportable in a standard inspection truck, a van or a pickup. Request a free, on-site demo of CleverScan, the most portable manhole scanner on the market. Next year, WEFTEC is back in Chicago for another showcase of the best technology the water and wastewater industry has to offer. Thank you for making this a great show, see you in 2019!